I’m sure you’ve been at least casually following the 2018 Winter Olympics in South Korea. There have been a lot of exciting moments, Shaun White being my personal favorite, and some great storylines. And once again, tons of rubber. For starters, two of the industry’s most prominent companies are TOP sponsors—Bridgestone Corp. and Dow Chemical Co. The world’s largest tire maker has supported U.S. athletes Nathan Chen (figure skating), Erin Jackson (long track speedskating), Elana Meyers Taylor (bobsled), Amy Purdy (para snowboarding), Evan Strong (para snowboarding) and Ashley Wagner (figure skating). Dow’s heat transfer fluids are used in three of the venues used for the ice hockey tournament to help maintain high quality ice. Its polyurethanes also were used to help insulate most of the walls and roofs at the Olympic Village. The company said that the PU structures are 98 percent recyclable. Speaking of the Olympic Village, it seems like there will be a lot of celebrating going on. The 2,925 athletes will receive a combined 110,000 free condoms—that’s about 37 per athlete and 10,000 more than what was provided during the last two Winter Olympics in Canada and Russia. While that may be a Winter Olympics record, it pales in comparison to the 450,000 provided at the 2016 Summer Olympics in Brazil. And let’s not forget the most obvious use of rubber—the hockey puck. IIHF rules require that it be made from vulcanized rubber, or another material approved by the IIHF. 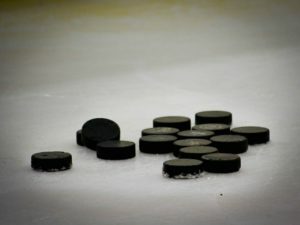 It’s estimated that up to 80 pucks are needed for one game. With 22 women’s and 30 men’s games scheduled, that’s 4,160 pucks! With all the events taking place, and the versatility of our industry’s flagship polymer, those probably aren’t the only connections rubber has to the Olympics.